52-year-old Jorge Gil: jewerelly designer, observer, minimalist. Jorge Gil talks about his art with the same fire as the burner he uses to create the desired colour effects in his jewellery. The Cuban is a jewellery artist in a class of his own. 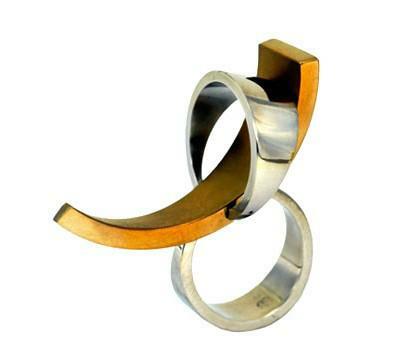 The objects and ‘wearable sculptures’ he produces (rings, earrings, necklaces and bracelets for women as well as for men) are so stylish and elegant that it is sur- prising that this Cuban designer has not yet made his name on the international stage. While it is true that jewellery artists often play a subsidiary role in the artistic world, their artistic skills and hence the high artistic content of the jewellery they produce is star- ting to be appreciated in some countries, particularly Germany. Or is it the “double isolation” of Cuba, as a Caribbean island with a political system that differs widely from its neighbours, that has hindered Jorge Gil’s international breakthrough? 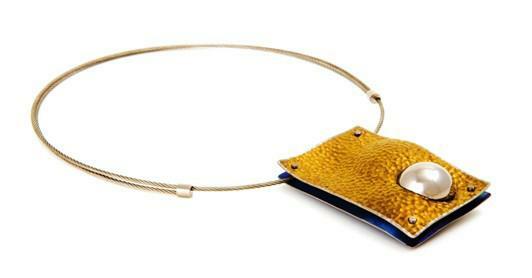 Nevertheless, the jewellery art is gradually gaining popularity, and Jorge Gil too is glad to be “forging ahead”. But the Cuban jewel-lery artist cannot be said to have chosen the easiest career path within his discipline - which is difficult enough in itself. Having graduated as an industrial designer, he went to the Academia de las Bellas Artes in Havanna in 1981 to study painting. He stayed there for 4 years, but he felt instinctively that this was not the right place for him. He felt drawn to sculpture and 3D objects right from his first year at the academy, but was unable to develop his interests to the full. A friend introduced him to the world of sil-versmiths and goldsmiths, which he immediately found enormously fascinating. His inner voice told him that he had to find a different path. He turned his back on the academy at the end of the 4th year because he wanted to devote his dissertation to the art of the silversmith, but they would not let him. So he started working full-time designing and producing jewellery. 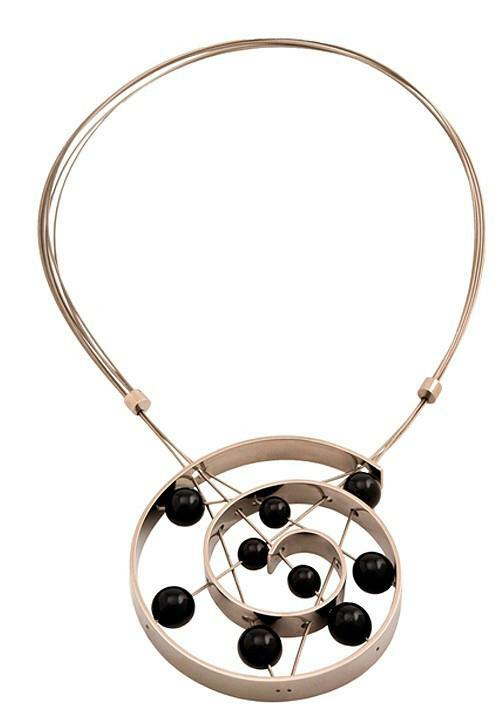 He began making bronze sculptures round 2008-2009, and finally he turned his hand to designing sculptural jewellery. Jorge Gil has now been a jewellery designer for 35 years, for the last 15 of which he has been one of the few in this field to choose to work mainly in titanium. 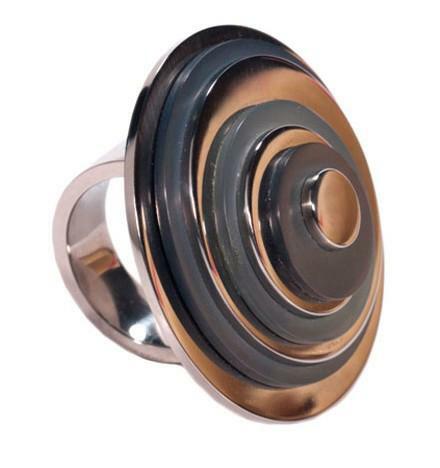 Once he was aware of the possibilities of titanium compared with traditional materials such as silver and gold, he knew that he had found the ideal medium for him. 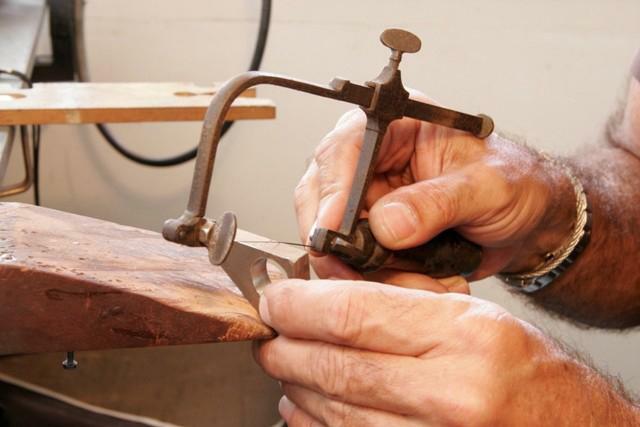 Jorge Gil was true to traditional values and tools when he started to make jewellery more than 30 years ago. His first jewellery was made mainly of silver and gold with some black coral, but about 15 years ago he began to be keenly interested in titanium, a material that had been rarely used by jewellers until then. In 1791, William Gregor discovered an as yet unknown element in the mineral ilmenite. This element was rediscovered in 1795 by Martin Heinrich Klaproth, this time in rutile ore. He called it titanium, after the race of Titans known in Greek mythology. 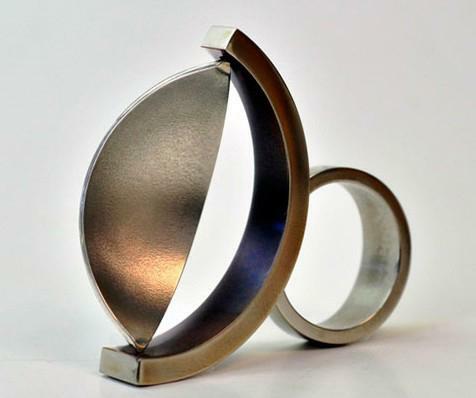 Titanium alloys are widely used in the aerospace industry because of their strength, light weight and extreme resistan-ce to corrosion and temperature fluctuations. 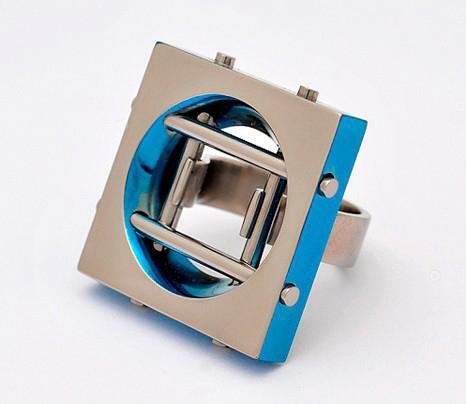 In addition, silvery white titanium has become very popular as a materi-al for jewellery due to its hypo-allergenic properties (it does not cause skin rashes), its good workability and high strength. 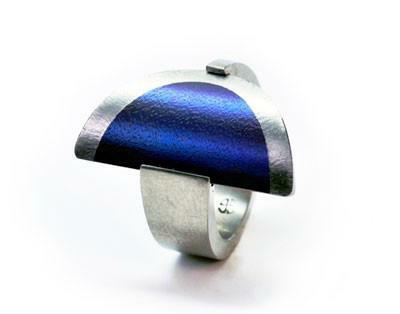 Titanium also withstands extreme temperature fluctuations. A traditionalist, who creates advanced, futuristic designs by playing with shapes. Another striking feature is the position of the stones on a necklace or ring, twisted, rotated, accentuated, or simply placed anyhow in a corner of the object. The details added to this jewellery are often mobile, like the beads on an old-fashioned counting frame. Soldering, widely used by silversmiths and goldsmiths, is hardly ever encountered when working with titanium. The stones are mounted on rings by pressure. Working with titanium is sometimes complicated, and can be more difficult than working with traditional materials. But the jewellery designer who goes for the most difficult approach often comes up with the most original, artistic solutions. Only the artist who is prepared to experiment can reach a higher level. Jorge Gil is a Cuban in heart and soul. He loves his native country and cherishes its tradition; and while he strives for international recognition like everyone else, his designs could only have been created on his island. Jorge wants to remain in his Cuban studio with its primitive equipment. He is currently engaged in opening a gallery in the historic heart of Old Havana together with his wife Monica Kemmerle. “This will be the crown on his work,” enthuses Monica. 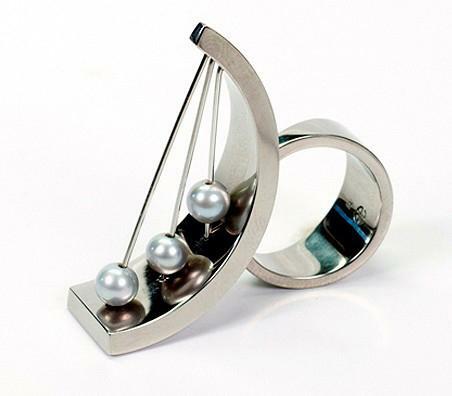 Jorge Gil was awarded a prize for his complete oeuvre in 2009, presented by the Cuban FIART annual Arts & Crafts Fair. And he has twice participated in the “SIERAAD” International Jewellery Art Fair held in the Westergasfabriek, a former gas works in Amsterdam that is now used as a cultural venue. His work was highly praised there, especially for its artistic content. 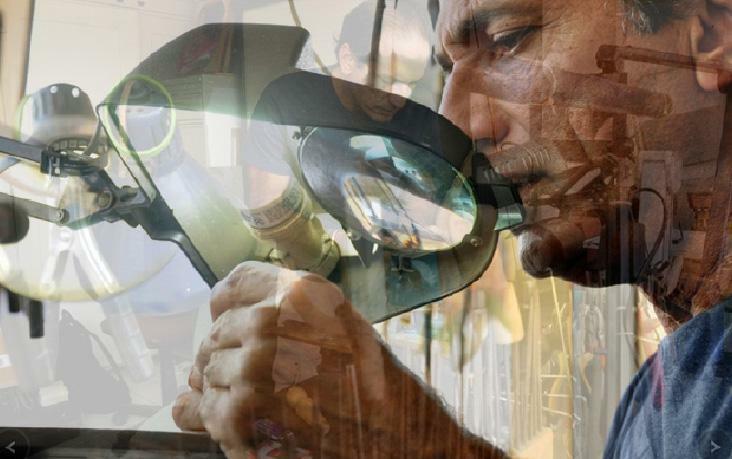 Jorge Gil’s work was also recognised at the 34th International Festival of New Latin American Cinema, a renowned film festival held annually on Cuba (this time December 2013). This is the second time the organisers asked him to make the awards presented to the prize winners in the different categories (33 bronze statues in three different sizes on a black marble base - see the photo on the right).